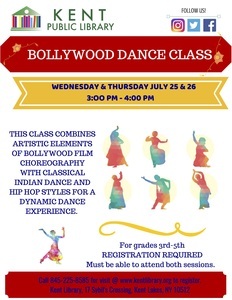 The Kent Public Library is offering a Bollywood Dance Class for grades 3-5 on Wednesday, July 25 and Thursday, July 26 at 3:00. The class combines artistic elements of Bollywood film choreography with classical Indian dance and hiphop styles for a dynamic dance experience. Registration is required. Students must be able to attend both sessions. The Kent Library is located at 17 Sybils Crossing in Kent, off Route 52.